In one line: it was insane! I actually took some days to visit San Fran as it was my first time there, and it’s a super foodie place! My favourite? So far it’s Tommy’s Joynt. If you’re planning a trip just ask, I have a list of yummy and quirky places to visit like the Wave Organ. Now, getting to the actual Dreamforce.It started on Sunday for me with registration at Moscone West which is only one of the 17 buildings where the 4 days of conference were hosted to manage the 170,000 attendees! Check out this map to see the extent of the campus! On that same Sunday we had the Admin Track Speakers Drinks, where we took some nice Trailblazer hoodie pics. Check out previous Trailblazer pictures here – looking forward to see if any of mine makes it (as I am terribly good at closing my eyes at pics!). I learnt as well, that being an MVP gets you preferred seating, the ability to jump queues and keeps you well pampered from special breakfasts and parties, to even MVP PJs (maybe that’s the “Dream” in force… so we can now be 24/7 with Salesforce in mind xD). The concert on Tuesday was great with Alicia Keys and Lenny Kravitz. Somehow I was lucky enough to get some tickets for the Thursday night wildfire relief concert ‘Band Together’ with Metallica, John Mayer with Dead and Company, Dave Matthews, G-Eazy, Raphael Saadiq, and Rancid. One of the key highlights for me was the session ‘Conversation with Michelle Obama’. We were not able to take pictures or distribute content, not even the Press could report on it. But what I can say over all is that she is quite an inspirational speaker, reinforcing our duty to look after future generations right now in what we do, how we behave and the sacrifices we should take. 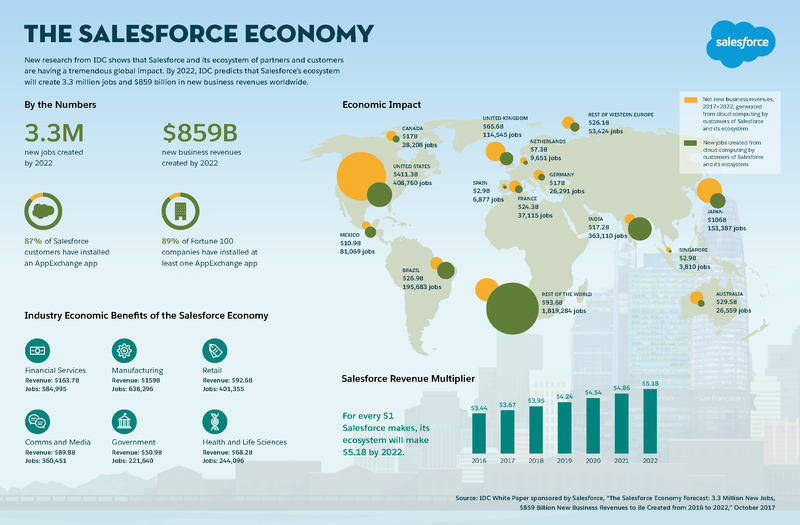 The other big highlight was from the main keynote with Mr Benioff: this is the ‘4th industrial revolution’ and the ‘Salesforce economy‘ is predicted to bring 3.3 million new jobs and more than $859 billion in new business revenues worldwide by 2022. I feel extremely lucky to be part of it and whoever may be thinking to make the jump over, these numbers can only confirm your thoughts. For more info on that, have a look at Mike’s post on the main keynote and 4th Industrial Revolution. I was supporting the Trailhead quick starts and had the opportunity to be on shift while a group of the Girls Scouts came along to get started with Salesforce. It was a really great experience, so many of the ‘freshly baked’ trailblazers almost couldn’t believe they were able to learn and have the Salesforce developer edition for free! It’s very pleasing to be the messenger of such a good news. Oh! and our salesforceweek.ly talk went alright I think, fully booked! Aside of the mymymy announcements that Mike took us through and Chris’ digest last week, I was particularly excited to learn that Google is joining IBM & AWS as a Salesforce strategic partner, yeah! Now let’s wait and see what this brings us… so far it’s the integration with Google Analytics 360, the first time ever it has integrated with a third party. Another cool thing was on Commerce Cloud (previously known as Demandware before it was acquired) which now has Instagram shopping integration, where brands can tag products in their posts with product information, creating shoppable content. Overall a great experience had in a really intense four days, which I wish was longer as there is so much to do, things to see and people to meet. Conclusion: I would do it all again! This entry was posted in Opinion and tagged Dreamforce, DreamOlé, Lighting Experience, Salesforce, Salesforce Administrator, Salesforce Weekly, Trailblazer Community, Trailhead. Bookmark the permalink.